Combine las compras con Shakespeare en un tour de un día completo de Stratford-upon-Avon, los Cotswolds y Bicester Village desde Londres. 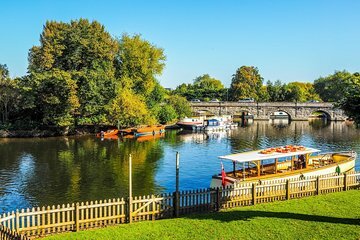 A partir del tiempo libre en Stratford-upon-Avon, ciudad medieval y lugar de nacimiento de William Shakespeare, continuará a Bourton, conocida como la "Venecia de los Cotswolds" debido a sus canales y cafés. Pase más tiempo libre navegando por más de 130 boutiques de alta gama en el centro comercial Bicester Village. Descubre Bourton, conocida como la "Venecia de los Cotswolds" por sus pintorescos canales. The tour did not take place, therefore I cannot rate it. Very interesting tour over wise but the Bicester Village, I think it is unnecessary addition to the tour especially in the beginning of the tour. Also, I would expect more stories, however we have got them quite well as well. Costswolds in so beautiful area. We were surprised to find out that we were the only ones in this tour and it came out to be a private tour at that! Wow! Paul was very knowledgeable and accommodating and brought us first to Bicester outlet for some amazing shopping experience and got some good deals! My favorite of course was the cotswolds where we saw charming honey coloured homes and villages and was able to take amazing photos which my friends loved to see! We missed going to stratford upon avon though since we spent more hours in the Bicester outlet that we ran out of time.... too bad we didn't get to see Shakespeare's home. I got ripped off at the Calvin Klein store in Bicester Village. The clerk put parking tokens in with my coin change. I didn't discover it until the next day. My advice: look carefully at your change from the stores there. Vat tax refunds are a pain when you are on a cruise ship. Stratford Upon Avon was great, but crowded. I wish there had been more time there. The Costswolds were definitely worth seeing. A well organised and informative tour led by Mr Paul M. The places are so beautiful and relaxing, pity time was limited. Thoroughly enjoyed this day which was made even better by our driver/tour guide, Paul M. Lovely country side, beautiful old buildings and interesting commentary by Paul. Would highly recommend this trip.